The children in class with Meg and Kaylie had so much fun engaging in the Musical Instruments theme last month. The room was filled with all different types of music from classical instrumentals to early childhood favorites, and the children loved moving and dancing to them all. Some of the favorite additions to the classroom in February were the ukulele and the large bass drum. The children really enjoyed experimenting with the sounds they could make and used different toys to bang on the drums and pianos. Music is such a wonderful teaching tool and one that Meg and Kaylie will continue to use throughout the year. The friends with Marina and Kristen started off the month exploring recycled materials and learning how to use items such as paper towel tubes, tissue boxes, and plastic containers in different ways. 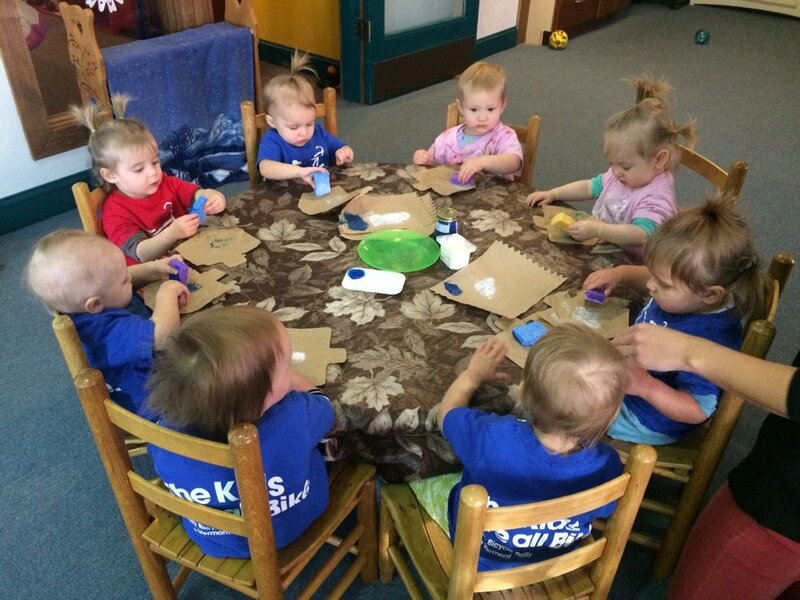 One of their favorite activities involved pom poms, paper towels tubes, and small containers. The children practiced feeding the pom poms through the paper towel tubes and experimented with the different tops and how to secure them onto the containers. 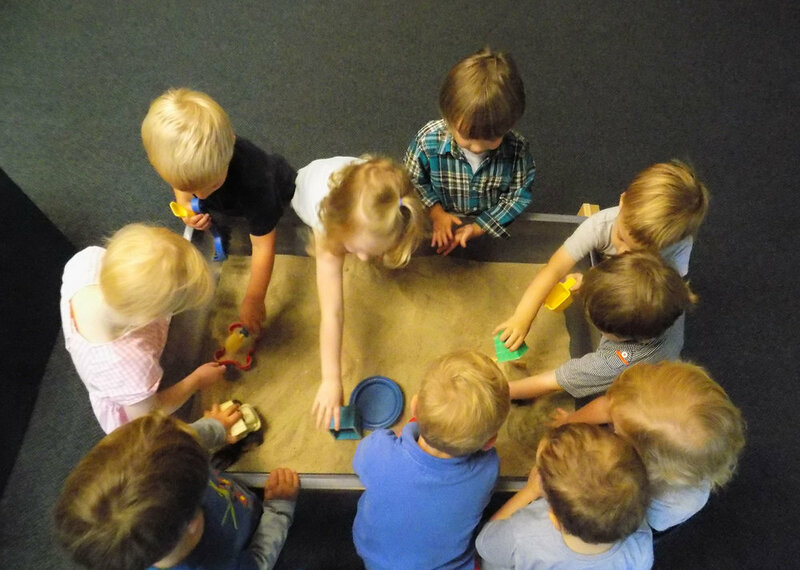 They delighted in figuring out how to remove the tops, and it quickly became a game to see how many times they could get a teacher to help them put the tops back on. It is amazing how much joy they can find in the smallest of things. So many wonderful things have been happening in the class with Anne and Jacey. February was focused on all things construction and the children really enjoyed this creative and imaginative theme. 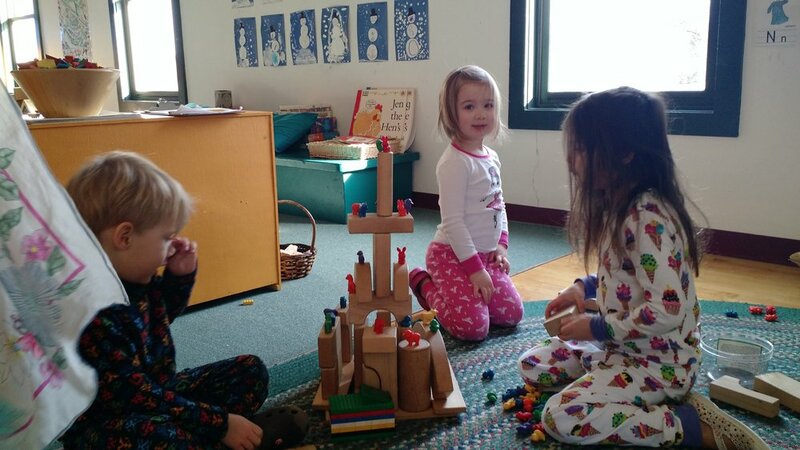 The used recycled cardboard blocks to build towers and bridges and explored different ways to make these constructions fall safely in the classroom. The construction theme even spilled over into the Valentine’s Day celebration as the children worked on painting tissue boxes to look like construction vehicles that were then used as mailboxes for their friends to deliver cards and treats to. This is one of the children’s favorite themes and they always have so much fun pretending to be construction workers and construction vehicles. The friends with Liz and Amanda spent the month of February exploring the arts of Dance, Drama and Movement! It is so important for young children to move their bodies freely and part of this theme is helping them to learn how to do so safely when other friends are around. Liz and Amanda engaged in movement activities such as “freeze dance” and “follow the dancer” that modeled following one and two-step directions and how to move in both large and small spaces. To incorporate drama into the day the teachers made a “bed” out of blankets and pillows and the children all pretended to be monkeys jumping to the song “Five Little Monkeys Jumping on the Bed.” The children continued to explore yoga as an activity and learned a few more poses such as cobra, shark and rainbow. Continuing the theme of music, the friends with Nikki and Cara focused on Musical Instruments including, brass percussion and strings. One of their favorite activities was listening to different music and trying to figure which instruments were making each of the different sounds. They paraded around the room with homemade shakers, danced fast and slow to different types of music and used their fingerprints to make notes along their own staff. In addition to Musical Instruments, the children celebrated Valentine’s day and heard stories about love and caring and practiced doing kind things for one another and the school as a whole. It is so wonderful to see the children helping one another and sharing their love and kindness so openly. The children grew so much and reached so many milestones over break and through the month of January. From sitting on their own to pulling up and moving around the room, we have all celebrated these accomplishments and have continued to explore new ways to help foster and encourage this growth. Some of the children had the chance to explore snow from outside and splash in the water in the warmth of the classroom. A fun side project that Kaylie and Meg have started is a series of themed photos that are displayed on the wall each month. During the month of January the theme was “A View From the Top” where the children were photographed from above as they were drinking their bottles. February’s “Tunnel of Love” theme is well underway and the photos are so much fun to look at. During the month of January, children in class with Marina and Kristen learned about winter and winter animals. They enjoyed exploring outside on the playground and taking many walks around the campus. It has been so fun to watch the children’s excitement as they explore the newly fallen snow and work diligently to move around in their warm and cozy snowsuits. One of the children’s favorite enrichment activities was using birdseed, toilet paper rolls and “Wow” soy nut butter to create bird feeders for the birds that perch on the trees outside the window. All of the children excitedly gathered outside and had a chance to help Marina hang the bird and small critter feeders for the winter animals. This was such a wonderful enrichment for the children who have shown a great love of all the Earth’s creatures, especially the sounds they make. Winter, snow, and ice were a huge draw for the children with Anne and Jacey during the month of January. They explored outside, sang songs about winter and used the coldness and snow of the season to talk about winter animals and how they prepare for and survive through winter. The children had a lot of fun pretending to gather food as the animals do, creating warm homes and of course taking long winter naps! 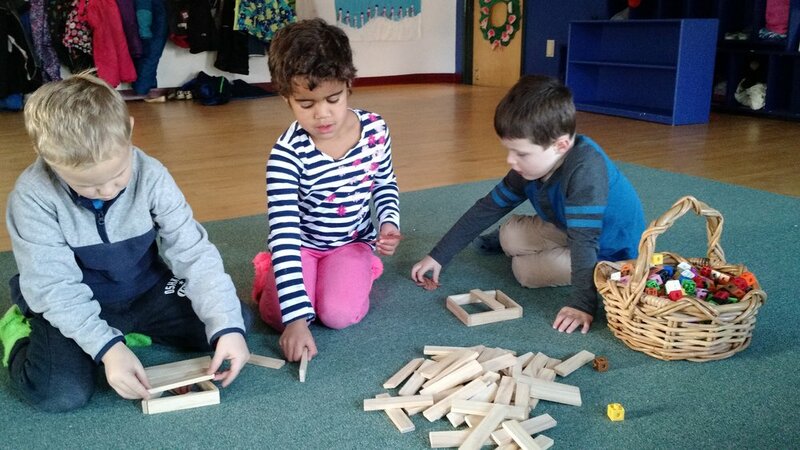 Throughout the month of January and continuing in the months to come, the children began exploring shapes and colors and have been introduced to numbers and counting through everyday play as well as meal times, enrichment activities and circle lessons. They are all growing so fast and learning so much. This is a very exciting time of year for all of the children and teachers. During the month of January the children with Liz and Amanda were transported each morning to the prairies of North America. The children heard stories about life on the plains learning about both animals and people and the different way things were when the plains were just being settled. The children had a lot of fun playing prairie games such as hopscotch, potato sack races and a bean bag toss. There was so much joy and laughter as they were learning how to play. They also had the opportunity to experience a little bit about how food was made before grocery stores as they worked hard shaking cream to transform it into butter. They then tasted their creation on freshly made gluten free biscuits. At the end of the month the children practiced using scissors to cut down the “grass fields” they grew when the blades got too long. As the children entered the classroom with Nikki and Cara during the month of January, they were transported deep into the forest with woodland creatures, through songs, stories and exciting enrichment activities. Many of the days involved talking about animal tracking, searching for footprints in the snow both on the playground and in the forest and pretending to be the animals they were learning about. 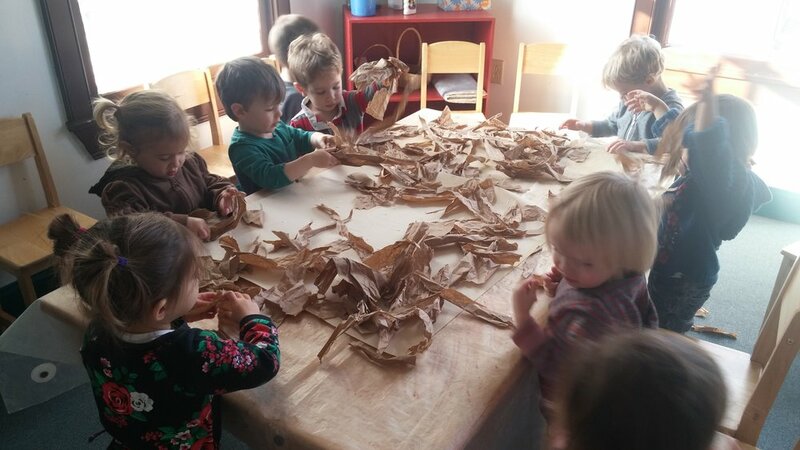 They explored caves created with cloth and chairs as they searched for bears, practiced their echolocation skills as bats in a darkened room and built squirrel dreys using grass, stick, leaves and other natural materials. The children show such compassion and care for animals, and it is wonderful to foster this love of nature. December was a month filled with holiday celebrations from around the world. We started the month with an all school Story by Heart of St. Nicholas day. The following day the children were surprised to find clementines in their shoes. The children were filled with wonder as they discussed how St. Nicholas did this. All of the classes celebrated such holidays as Hanukkah, Kwanzaa, Christmas, St. Lucia’s Day and Winter Solstice. The last two days before vacation were pajama days. Teachers and children alike came to school in pajamas! The school gathered in the big room for a reading of The Polar Express. It was a definite highlight of the month and a special way to start the winter vacation. The class taught by Sherri and Sandra enjoyed learning about St. Nicholas and left their shoes out to find a special clementine treat that was left by St. Nicholas. The children also enjoyed reading “The Gingerbread Girl” and used fine motor skills to make beautiful paper gingerbread girls. Kaylah and Hunter’s class enjoyed singing songs about snowmen and reading the book “Katy and the Big Snow” By Virginia Lee Burton. The children also loved making and eating Latkes and applesauce. 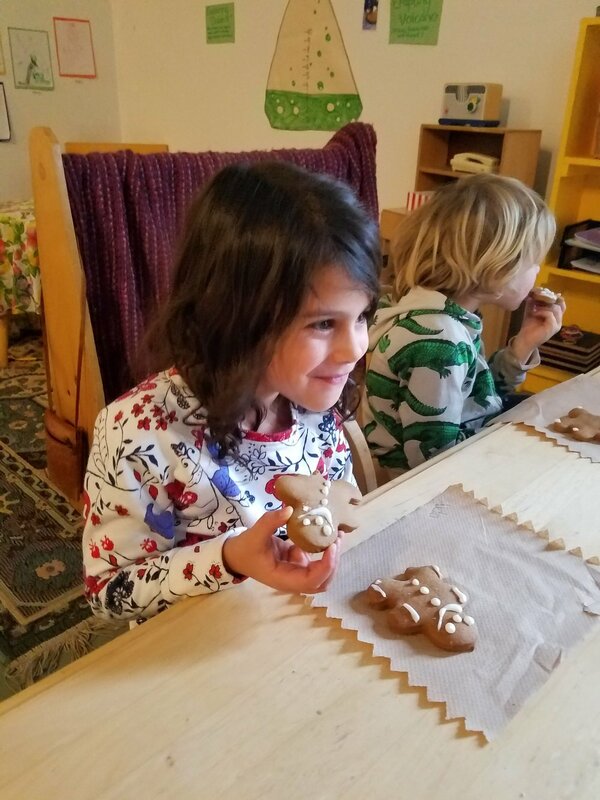 Danielle’s class was hard at work creating paper clogs and learning all about St. Nicholas and the beautiful traditions that make that celebration so special. The class taught by Haley made beautiful paper crowns to celebrate St. Lucia day. St. Lucia is the celebration on the 13th of December to celebrate the light, love, and feast of the season in scandinavian countries. The class taught by Hilary spent the month of December ice skating with wax paper and making beautiful menorahs made out of paper and fingerprints. 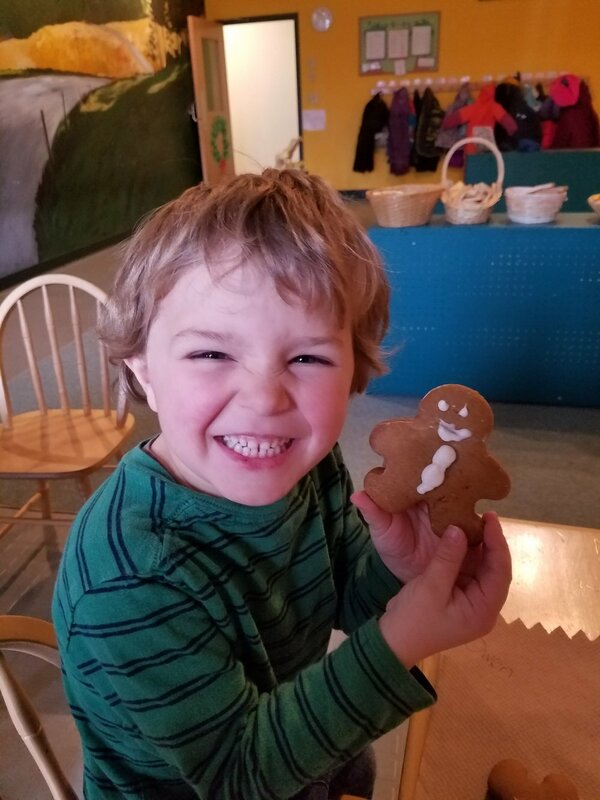 The children in Amber’s class “travelled” to Germany to learn about all the Gingerbread and the story of The Gingerbread Boy, on their return “flight” home they found a large plate of gingerbread cookies. Delicious! The wonderful class taught by Angela was busy creating a holiday winter wonderland. They made beautiful literary light to decorate the wall, practiced size differentiation by making adorable snowmen for the wall, and made gingerbread for children to eat! The STEAM classes created beautiful crystal in December and observed the chemical reaction created by using borax, vinegar, and baking soda. Throughout the next couple of weeks the children carefully documented the changes that took place and ended up with beautiful crystals! For Tuesday tool technology day, the STEAM classes experimented with common classroom tools such as scissors, pencils compared to ink pens and created beautiful snowflakes for the classroom. On Thursday, art day, the children used paint and straws to demonstrate how germs are spread through the air and when we sneeze. For math the children created and learned all about three dimensional shapes and patterns. The children with Meg and Kaylie really love hearing and making different sounds so December was a perfect month full of holiday music and the jingling of bells. “All the Snowflakes” and “Dashing Through the Snow” were two of the most favorite song choices that elicited the biggest smiles and expressive reactions. In addition the fun music, Kaylie and Meg worked with the children to help create footprint mistle "toes" and a holiday gift that we hope all of the families enjoyed. The friends with Marina and Kristen had a lot of fun during the month of December exploring the different holidays and enjoying many enrichment activities. They started off the month using their hands and paintbrushes to add greenery and snow to the winter solstice tree and really enjoyed feeling the paint between their fingers and moving it around on the canvas. As a class, they celebrated Christmas, Hanukkah and Kwanzaa through stories and songs and art. They created collage wreaths for Christmas, used sponges to paint paper dreidels for Hanukkah and used black, red and green squares to create Kwanzaa placemats. The room was full of holiday music such as Jingle Bells, Let it Snow, and Dreidel, Dreidel, Dreidel most of the day as the children eagerly signed and asked for more at the end of each verse. What a fun and enriching month they had! The friends with Anne and Jacey started off the month using finger paints to create a beautiful banner with the word celebrate and proceeded to do just that throughout the month. They used sponges and green paint to create Christmas wreaths and finished them off with glue and red pom poms for a nice festive touch. For Kwanzaa the children again used glue and pasted red, black and green tissue paper on different toilet paper rolls that they then used to create a kinara for display in the classroom. The children really enjoyed experimenting with the sticky glue and trying to figure out how to get the paper to stick to the roll instead of their fingers. One of the children’s favorite activities was playing pin the flame on the menorah. Each child had a chance to hold one of the paper flames and place it atop one of the nine candles, including the shamash. They all had such a wonderful few weeks in December and really enjoyed the holiday theme. 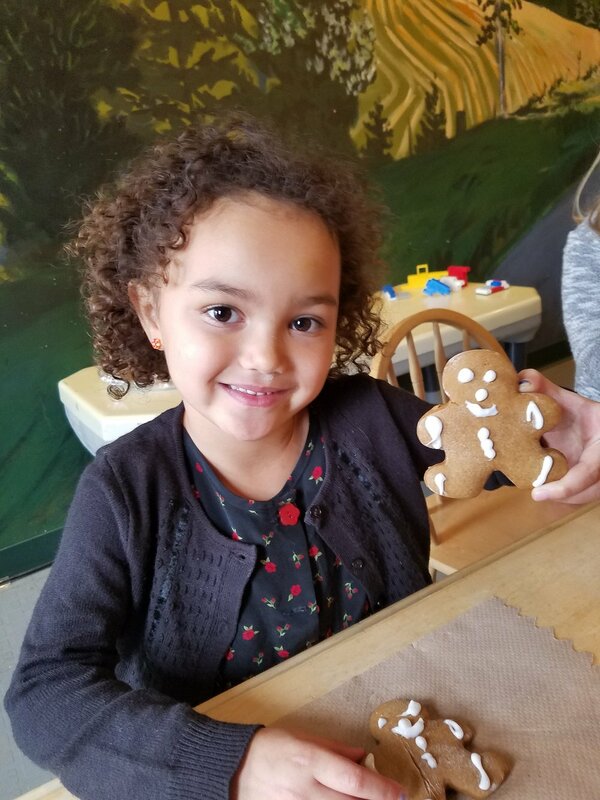 The children in class with Liz and Amanda explored Kwanzaa, Hanukkah and Christmas through stories, songs, and a lot of fun enrichment activities. 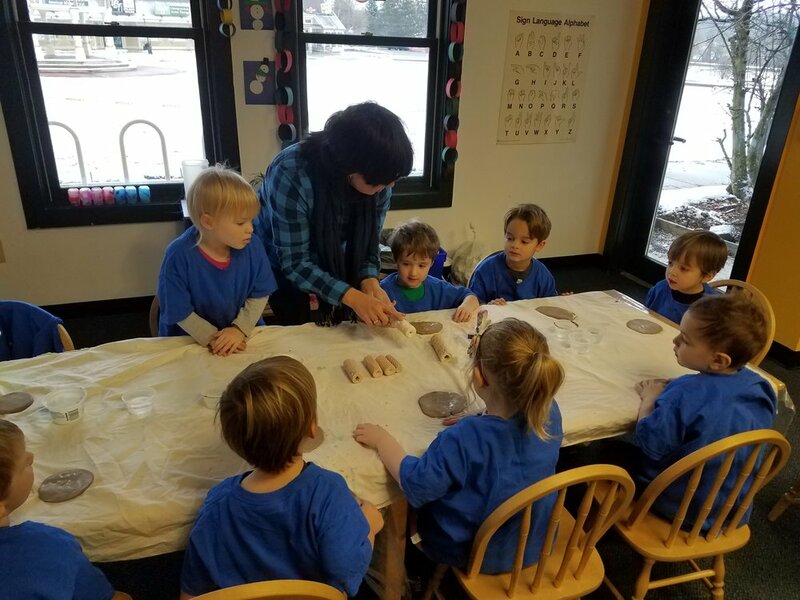 The children worked together to paint a large canvas menorah and used clay as they learned about dreidels and sang the dreidel song. The children also really enjoyed singing The Twelve Days of Christmas dancing with scarves and acting out the different verses pretending to milk cows and leaping like lords. Towards the end of the month some of the friends helped to paint red, black and green candles for the class kinara and practiced counting from one to seven as they set the candles up in the kitchen area. As a special treat Tucker’s mother, Katie, came in and helped the children create fun and festive snowman magnets! The children loved experimenting with the pieces and the little snowmen were so sweet. In Nikki and Cara’s class the children also explored some of the different holidays that are celebrated in December. The children all really love to move and dance so there was a lot of holiday music to be heard each day which filled the room with laughter and dancing. One of the favorite moments was when the children discovered that Saint Nicholas visited the school one night and left delicious clementines in their slippers. Many of the children chose to eat their clementines right away at snack. Thank you so much Saint Nicholas. The children were also introduced to Kwanzaa and heard about the seven principles of the holiday and focused on unity, working together and supporting one another. At the end of December Nikki and Cara used the “We Three Kings” book that the children were all interested in to talk about Mary and Joseph looking for a place to lay baby Jesus and how the kings were traveling to bring the baby gifts. The children then pretended to bring different gifts to the babies in the classroom. Happy First Thanksgiving! The children with Meg and Kaylie worked very hard all month to create adorable “My First Thanksgiving” shirts to share with their families this holiday season. We hope everyone enjoyed them. 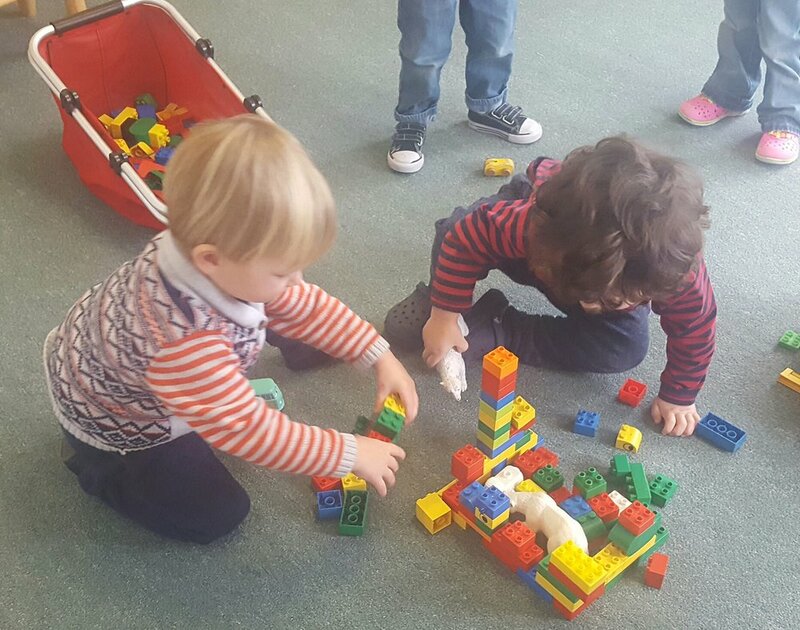 Some of the children have started to show more interest in finding ways to move around the classroom and reach toys they are interested in playing with. They are all watching one another and experimenting with crawling, scooting and rolling around the room. November was full of stories about animals and feelings, shapes and colors, and a lot of song books. It is so wonderful to see the two way “conversations” that are happening and listening to the cooing and babbling and watching the smiles of all the children. 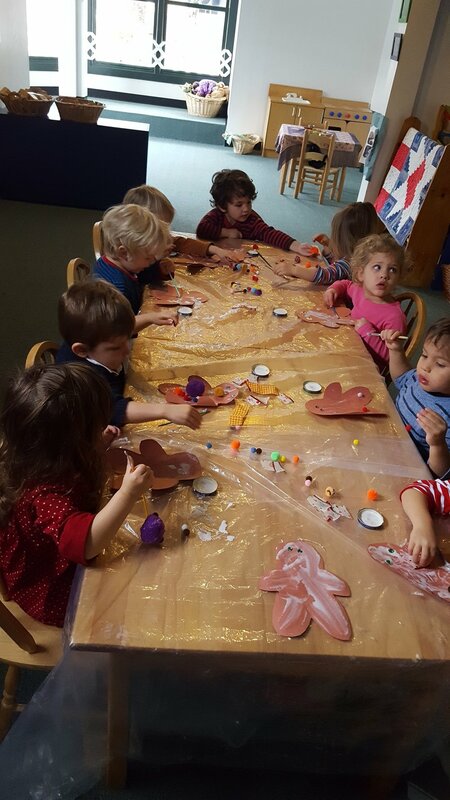 During the month of November the children explored emotions and the Thanksgiving holiday through songs, stories, and projects. The children enjoyed making handprint turkey placemats for the holiday and spending time outside exploring on the playground. Books have been an increasing interest with all of the children. 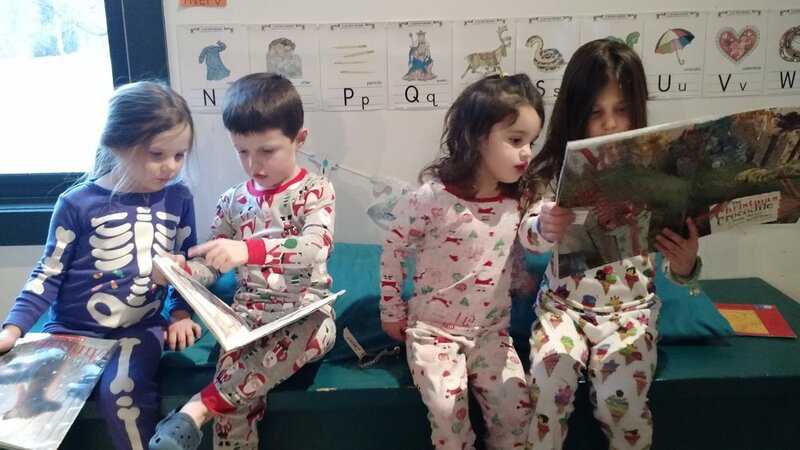 They have been eagerly choosing stories and making themselves comfortable in the closest lap to hear about Duck and Goose, sing along with “The More We Get Together” and explore emotions with the “Baby Faces” books. There is so much excitement when new books come into the classroom. During the month of November Anne and Jacey explored Feelings and Thanksgiving with the children. They explored different emotions through stories, songs and projects. The children created collage faces that depict different emotions and sent home turkey magnets for the holiday. Along with the sentiment of giving, the class has been collecting donations of old jeans for “Blue Jeans go Green” a company that turns old blue jeans into insulation which is sent to Habitat for Humanity at no cost. If you have any old jeans you would like to donate please feel free to add them to the box outside of their classroom. The friends with Liz and Amanda used the inspiration from the sidewalk construction to explore vehicles and other “things that go.” They have had so much fun creating roads and tracks around the room using tape, bubble wrap, foam pieces and blocks. 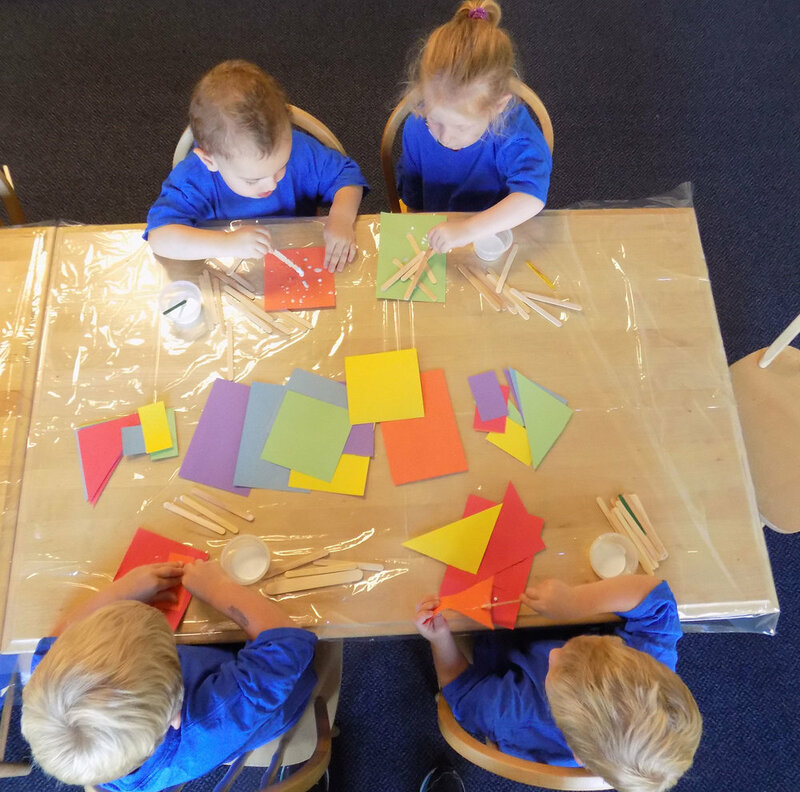 The children really enjoyed creating paintings using construction paper, paint and small matchbox cars and trucks; they spent a lot of time at the table dipping the cars into the paint and making engine noises as they drove around the table. It has been such a treat for the children to have trucks and “diggers,” busses and cars right outside the classroom. This month’s theme was definitely a hit. This class chose to participate in an Author study and dove into the world of Dr. Seuss during the month of November. They used the stories to explore many different early concepts such as rhyming, sorting, color recognition and letter sounds and of course a lot of fun imagination. The children were given the opportunity to explore different materials to create collage footprints, practiced using scissors and tearing paper to make green eggs and ham, and stacked blocks with apple shapes. Connecting the block to the story “Ten Apples Up in Top,” the children worked together to count how many apples could go “up on top” before the tower fell over. The children had so much fun with Nikki and Kelly and have welcomed Cara with open arms. Rhonda Mace, aka “Recycle Rhonda,” from the Chittenden Solid Waste District (CSWD) visited Heartworks in Shelburne on November 7th to help preschoolers understand why recycling and composting is important, and to learn how they can help “make the earth happy.” Rhonda visits around 50 schools in Chittenden County each year to promote the vision of CSWD, which is to maximize composting, reuse and recycling of products by diverting as much waste as possible from the trash. 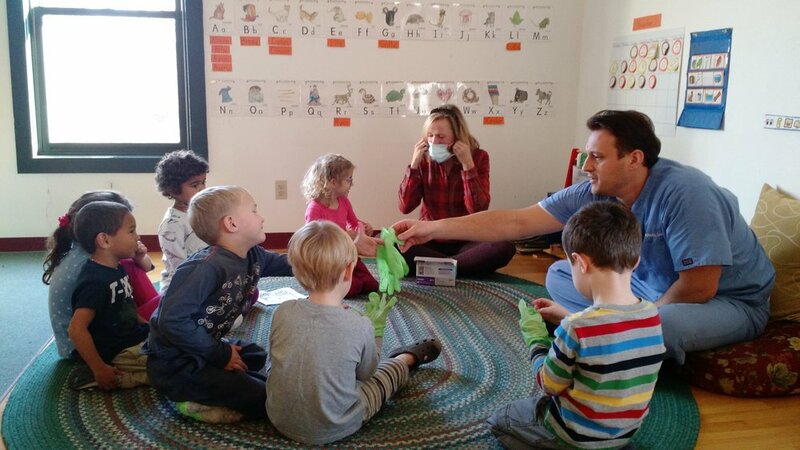 Rhonda explained to the children that each person in Vermont creates about three pounds of trash each day, but that over half of what we each throw into the trash could be recycled or composted. Using sock puppets named Bernie the Bacteria and Flo the Fungus, Rhonda demonstrated how to identify which items can go into the composting bin or the recycling bin, and which items need to go into the trash. She explained that Bernie and Flo like to eat everything that goes into the compost, including the paper towels that we use after washing our hands and paper napkins that we use when we eat. This month the theme in Sherri’s class was Kitchen Magic and Chemistry. The children used measuring tools to be kitchen scientists. They made their own finger paints out of kitchen ingredients and mixed food coloring into the paint to make it their favorite colors. Our school smelled of yummy pancakes that they mixed and cooked together. The children also made their own pumpkin pie scented playdough and brought it home to share. They were so excited to show their families their creation and have them smell it! Children with Kaylah and Hunter studied Life on the Farm. The children learned about sheep, pigs, chickens, and the importance of taking care of farms in Vermont and nationwide. The children worked on their fine motor skills and shapes by creating adorable shape tractors. The children really enjoying color mixing as they mixed red and white paint to create pink pigs. The children with Danielle learned about dinosaurs. They were serious paleontologists identifying dinosaurs and digging for bones in the sandbox. Each child created their own dinosaur footprint and made paper mache’eggs. 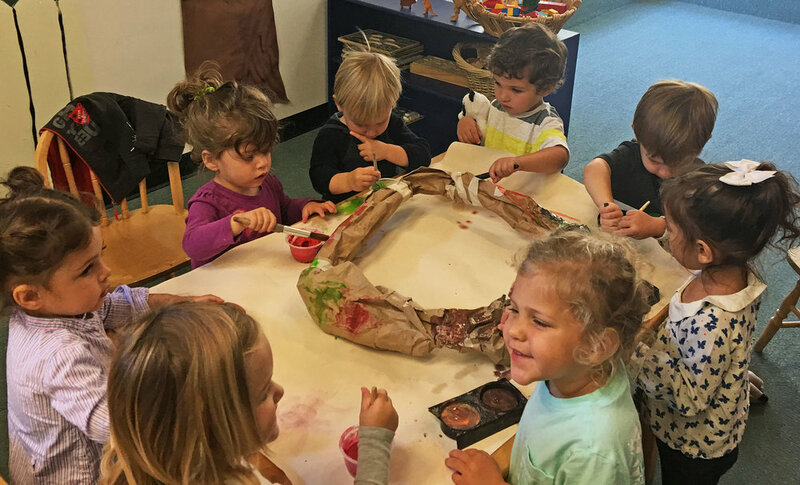 Together they decorated a life size footprint of an apatosaurus and found out that the whole class could all fit inside it! It was great to see how excited the children were to compare their own feet to the giant apatosaurus foot. Hilary and her friends learned about Vermont this month. They read the book, “The Sugaring Off Party” and looked at real taps that are used to tap maple trees. Then, the children took turns crushing ice and taste tested Vermont maple syrup on top. The children also made a chart of the fun things you can do in Vermont in the winter. They practiced balancing on “snowboards,” pretended to snowshoe and built ski trails on snowy mountains. It was so fun seeing the children really using their imaginations! Children with Haley learned all about carnivals. They worked on thier gross motor control and hand-eye coordination while competing in a ring toss, balance beam, and parachute popcorn game. The children create delicious carnival treats. They mixed glue and food coloring to create “cotton candy” and baked delicious “funnel cake”. During November children with Amber studied chemistry. 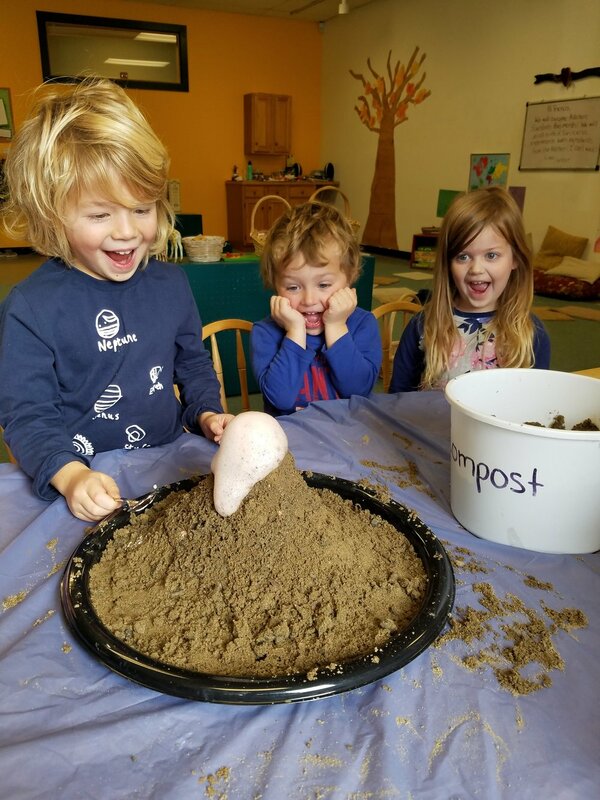 They learned all about chemical reactions because preschool age children are inquisitive and open-minded, perfect traits for budding young scientists! The children’s favorite chemical reactions were mixing baking soda and vinegar to make a volcano, making oobleck, and magic milk. What a wonderful hands on learning month! The children with Angela learned all about circulation and healthy bodies! They learned about the functions of the heart, lungs, and circulatory system. The children’s favorite projects were using straws to blow air through to show how germs travel and using fine motor skills to make ripped paper “salads” that really looked delicious. The children in the afternoon STEAM class with Danielle have been hard at work on Fridays learning wonderful math skills. They have been learning about patterning, counting, and shape and number recognition. The children particularly enjoyed the dot dabber dice game. Following the reading of Ten, Nine, Eight by M. Bang the children created their own “dice” using coffee filters and bingo dabbers. Children in the afternoon STEAM class with Haley were very busy this month. The children enjoyed all sorts of projects, experiments and fun! The children particularly enjoyed reading Elmer by David McKee and painting beautiful Elephants. The scientists in STEAM with Amber donned their science goggles and watched color mixing eruptions. They created the green eruption by adding baking soda to blue colored vinegar and yellow colored vinegar. 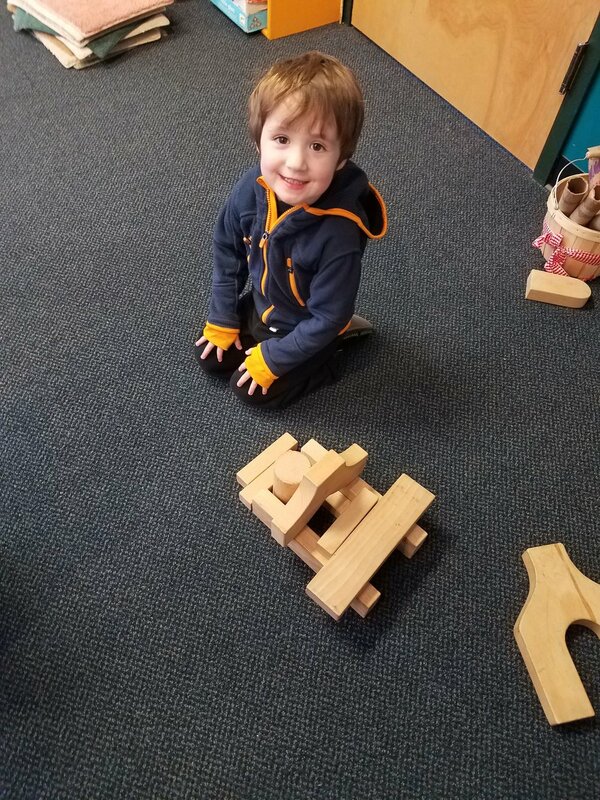 The children in the afternoon class with Angela spent a wonderful engineer afternoon reading Rosie Revere, Engineer by Andrea Beaty and creating their own solo cup structure. The children first worked individually to see if they could create a tower using five to eight solo cups and then worked in small groups to create two large towers in the classroom. After working for a while the children built a tower over four feet tall, all made entirely out of solo cups! Starting Monday, December 5th there will be a large box near the front desk where items will be collected. Thank you in advance for your support of our special community outreach project. Children with Sherri and Sandra spent some time “down under” in Australia. The children learned about aboriginal art, some of the animals that call Australia home and Australian food. They also had fun going on a fall pumpkin hunt in the woods behind the playground. Children taught by Danielle and Kaylah and Hunter were busy learning about Chinese culture, food, and of course the Panda Bear! The children experimented with chopsticks in the dramatic play area, made beautiful Chinese lanterns, and created adorable panda bears in a multi-step, sensory, and day project. Viva Mexico! The children with Hilary and Haley took a “plane ride” to Mexico and spent the day exploring the country and the beautiful landscape. To start the study of Mexico the classes started each morning counting to 10 in Spanish and greeting each other with a morning Spanish song. The classes ended the month with making homemade guacamole and having a fiesta to celebrate Mexican culture and food. The two Pre-kindergarten classes taught by Amber and Angela spent the month on the continent of Africa learning about Kenya. The children explored the people of Kenya - how and where they live, what they eat and the animals of Kenya. The children with Amber particularly enjoyed learning about Zebras and marble painting adorable Zebras for the wall. Children taught by Angela learned some Swahili phrases and about the climate of Kenya. They created a beautiful african sunset for the the wall. Full STEAM ahead into another month of incredibly fun learning experiences in the afternoon, allowing children to expand their natural desires to explore, to imagine, to build, and to question. STEAM class with Danielle has been busy using the outdoors as their classroom. After conducting a science circle inside they go outside for beautiful fall hikes, classifying leaves, comparing colors and leaf shapes, using magnifying glasses to study leaves. Children in STEAM class with Haley have been busy learning all about gravity. They collected different objects from about the classroom and dropped them off from different heights. The children followed up the lesson by going outside to drop parachutes off the big climbing structure. Amber has taken the hands on concept of STEAM and applied it to technology. She set up four different learning stations using binoculars, magnifying glasses, flashlights and tweezers and after a discussion about how each tool makes their life easier and how the tools were invented, the children began to explore and discover the tools on their own. STEAM class with Angela spent an engineering day and transformed their classroom and themselves into structural engineers using tape, pattern bears, and newspaper for materials. They built and designed bridges from tape and newspaper from chair to chair, chairs to shelves, and shelves to tables. After creating bridges the children were able to balance bears on the bridges - How many bears fit on your bridge? The first month of school in the infant classroom is filled with getting to know one another, establishing daily routines for each child and simply enjoying being together. Meg and Kaylie have been working on a few small projects using handprints and footprints to create wonderful fall decorations. They have been spending so much time outside with all of the children walking around the campus and laying in the courtyard watching the leaves move in the wind and enjoying the end of summer and beginning of fall sunshine. 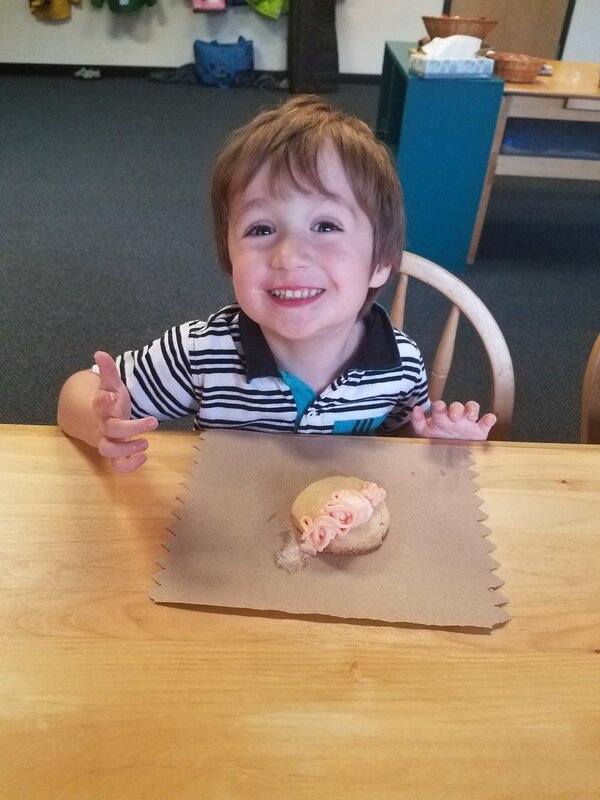 Our friends are growing so much and are reaching many new milestones just in the first few weeks of school! 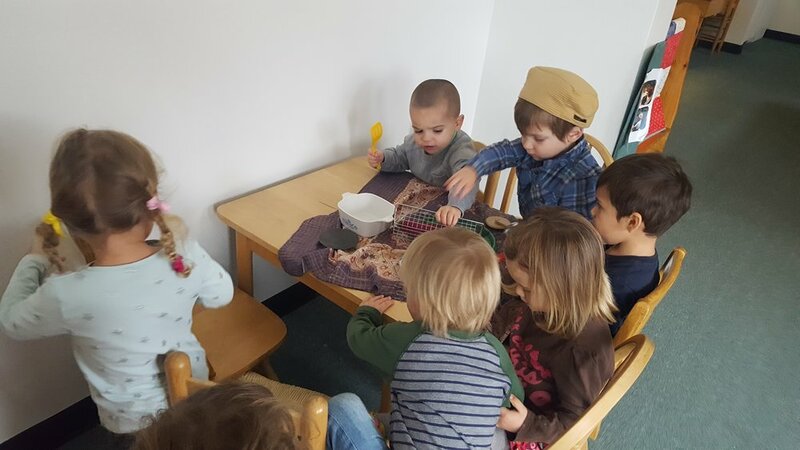 They have quickly settled into a routine and are having so much fun exploring the classroom space and getting to know their friends and teachers. The children have also enjoyed going on walks and exploring the playground getting as much fresh air and sunshine as they possibly can. Outside is definitely a favorite activity for the class. It has been so fun watching the children interact with one another and enjoy the day with excitement and wonder. What an exciting and enriching first month the children in this classroom have had! They quickly fell into a routine and are having small circles, wonderful enrichment times and are enjoying books and puzzles during transitions. Each month Anne begins with a group painting on canvas using paint and tape to create a word that relates to the theme. September’s word was “welcome” and the children had so much fun exploring the paint and mixing all the colors together. On the windows you will find heart shaped suncatchers that the children created using contact paper and colored tissue paper squares. The also used glue and colored leaf shaped pieces of paper to make fallen leaves for the fall tree on the wall in the classroom. The beginning of the year has been filled with so much laughter, joy and excitement. Liz and Amanda have quickly established a rhythm that works well for the children that allows them time to explore, read stories, move their bodies, explore art and music, and get to know one another. The class goes outside for fresh air and gross motor activities rain or shine and the children love that time to explore big body movements in safe and controlled ways. As the months go by the children will continue to learn about using verbal and sign language to communicate their needs, wants and emotions. Some of the favorite activities from the month of September were coloring paper for the “friendship quilt” and creating nature wands using stick, tape and items they found outside. 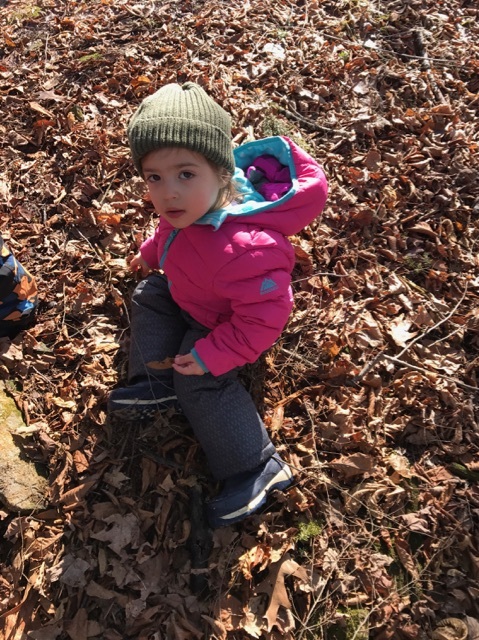 Hiking and exploring families in nature has been a favorite focus of the classroom this month. The children have been enjoying outside time in the forest looking for signs of animals and insects. 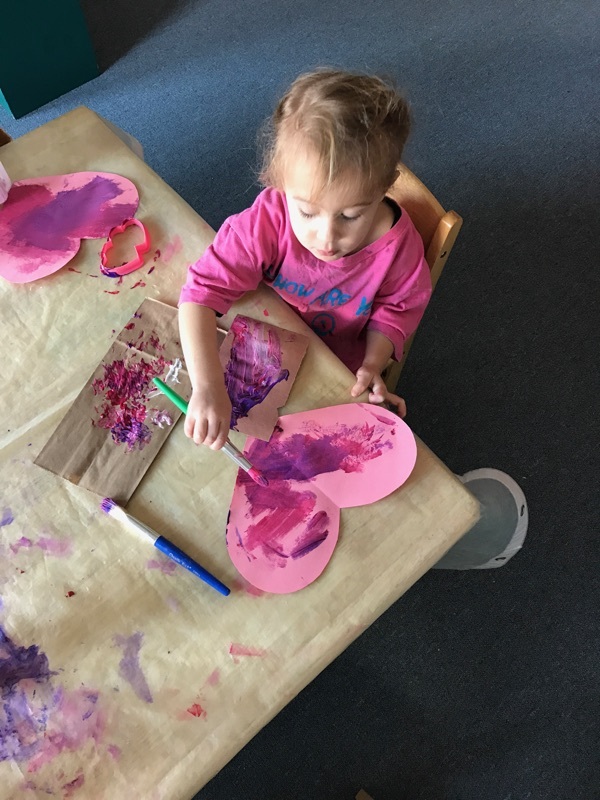 As a part of the Friends and Family theme, the children used crayons and paper to create mini “family portraits.” Each child had the opportunity to point out the family members they drew, and they were displayed on a family wall in the classroom. The children are enjoying exploring in the classroom and are working on using books and puzzles to transition between activities, learning new greeting songs during circle and using words to express their thoughts and feelings. Overall Theme for the two oldest classes is Cultures. Children with Haleigh and Nikki will study Australia - the land, language, people and animals. 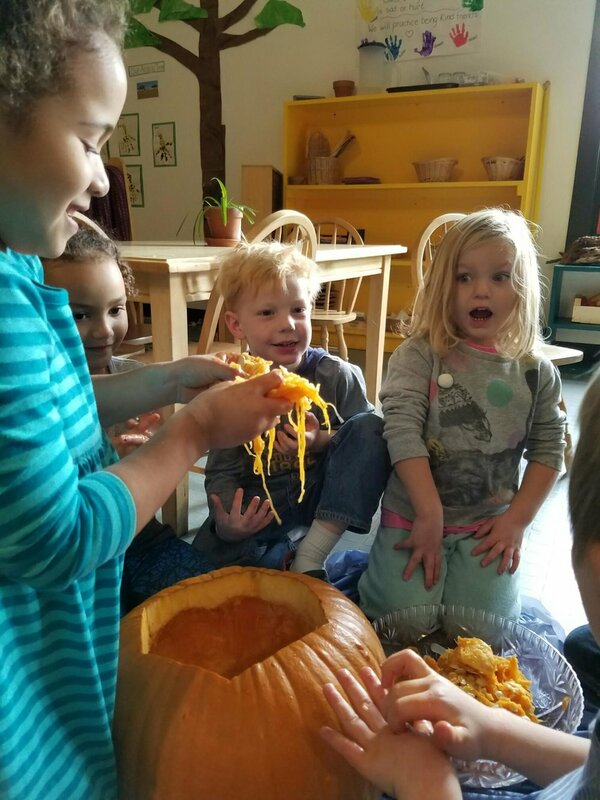 All classes will explore Fall and Harvest, as well as their own learning concepts such as engaging in parallel and cooperative play, language use and development, gentle touches and careful body movements plus appropriate gross and fine motor skills. We are all looking forward to the exciting activities and enrichments planned for this next month. The children with Sherri and Sandra have been busy creating a feeling of community in the classroom by making a handprint community wreath to hang on the door, making friendship dough (playdough) and drawing cards to deliver to different classrooms. Children with Kaylah and Hunter have learned all about family and friends. They created a friendship Garden using a beautiful painted canvas and delivered cookies to the school community. The children with Danielle spent the month learning about extended families. They learned how many people are in each child’s family and what it means to be a family. The children read a very sweet book titled, Mouse Paint by Ellen Walsh. After reading the story, the children enjoyed painting with their feet on large pieces of canvas. The children with Haley started the month with a wonderful discussion and project about what it means to be part of a community. They followed the discussion up with taking a hike through the “community,” collecting leaves as the colors became more vibrant and making leaf rubbings with the leaves that were collected! Children with Hilary spent the month learning about Community Helpers. They learned about fire fighters, doctors,construction workers, dentists, and police officers and what their role is in our Community. At the end of the month the children created a thankful wreath for the Shelburne Police Department. 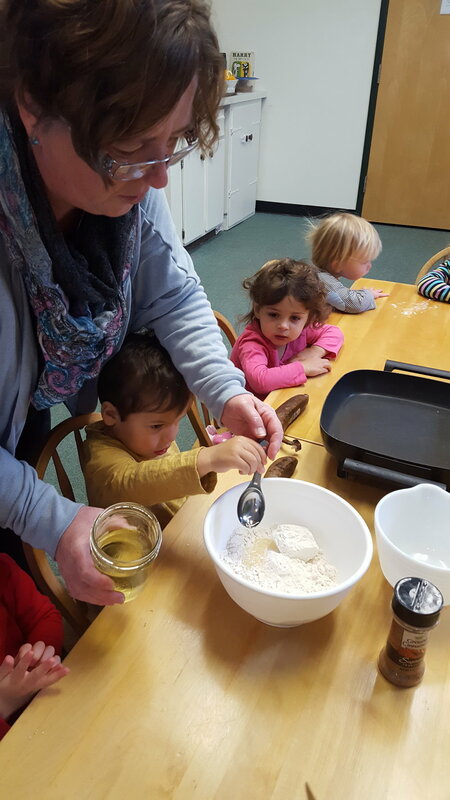 The children with Amber started September with learning about communities and made a Friendship Bread yeast starter. Over the next ten days they tracked the progress of the yeast, wrote out a card and directions for each class and delivered the yeast starter to each classroom! Wow did the school smell delicious. Children with Angela have been busy learning about Friendly Neighborhoods and what it means to be part of a community. To learn about Neighborhoods they talked about the different components that make up a neighborhood, walked around our school neighborhood and finally created a large map of our local community on canvas. What a wonderful successful start of the afternoon STEAM programs! The children have been busy with STEAM experiments, projects, building, inventing and observations. Some highlights from the children in Danielle’s class are science projects that involved walking water, and cloud observations. In Haley’s Wednesday STEAM class some exciting Engineering highlights are creating “blueprints” to draw the ideal playground and using blocks to create a mock playground. The children in Amber’s class have enjoyed working with numbers in all aspects of STEAM. They have been measuring with rulers, sorting and graphing crayon colors and counting with cubes. In the STEAM class with Angela children have dissected apples and then labeled their parts followed by a delicious apple snack. Using baking soda paint the children used eye droppers to drop vinegar onto paintings and observed the chemical reactions. Joanna May is our music teacher who visits our school throughout each month. Some of the classes have a scheduled time to have music with Joanna in the Big Room. Joanna incorporates singing, dancing, and movement into her music class. Whisk together flour, cinnamon, baking powder, salt, and baking soda in a medium bowl. In a separate bowl, beat together butter, sugar, and egg with a mixer until pale, about 2 minutes. Add apples, and stir by hand until combined. Add flour mixture, and stir until combined, about 30 seconds more.